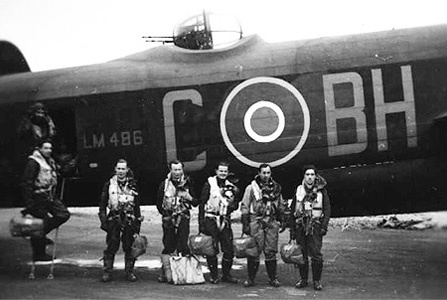 In March 1944 the unit was reequipped with Avro Lancasters. This BH-D LM488 was photograph in April that year. 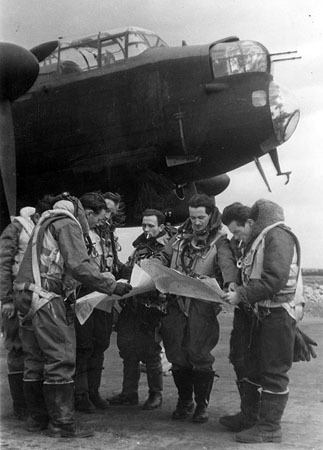 Left: The crew of Jerzy Rozanski shortly before they were lost during the mission to Gelsenkirchen in June 1944. BH-R in the background was lost in August that year. 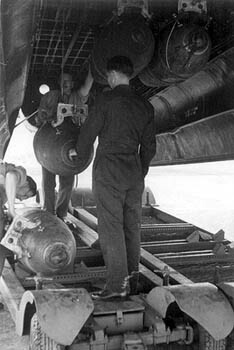 Center: The unit's ground crew loading Lancaster,s bomb bay. Right: One of the Lancaster characteristics were two tailfins. Here port rudder balance weights are visible over the light sky scene. 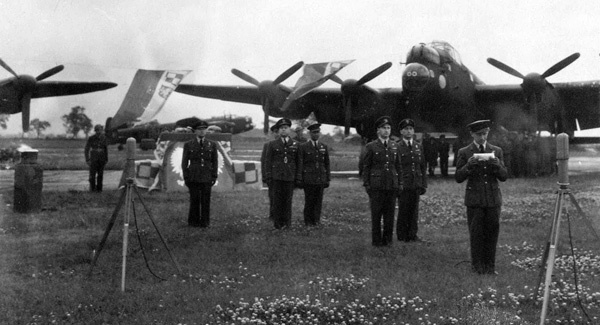 Left: Avro Lancaster of the W/Cdr Pozyczka with its characteristic "Lady in a Champagne glass" logo. 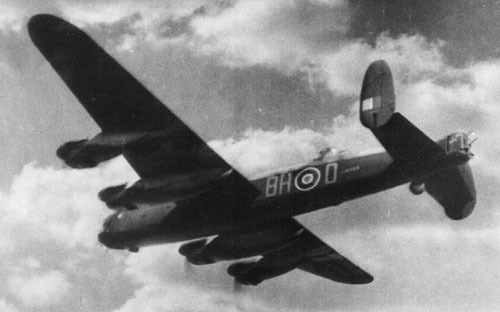 This BH-F, LL804 entered service in November 1943l. Thirty mission marked at the end of an extended (from 25) tour. 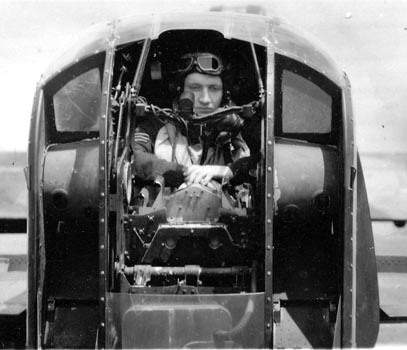 Notice the flat bomb-aimer's panel in the nose blister, under the two Browning machine guns in the front turret. Right: Detailed view of the rear turret manned by Sgt Roman Golicz. Notice lack of the machine guns taken out to be serviced. 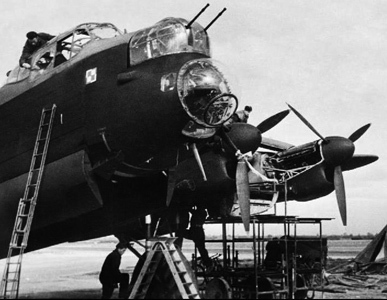 Left: This Lancaster (BH-O, LM632) has 49 missions marked on its fuselage. It was quite a thing for an aircraft to survive that many. 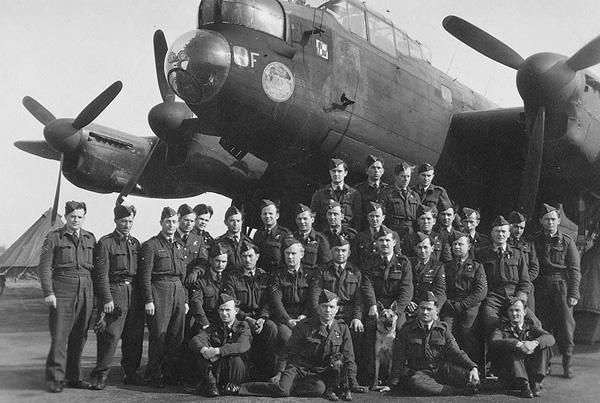 It was flying in the 300 squadron since October 1944, and was lost on April 9, 1945 while bombing Cologne. The crew of S/Ldr H. Rudakowski was lost after successful German night fighter attack. Right: Thanks to Paul Powels of Holland, we know now that this picture depicts the crew of Lancaster DV282 (BH-P), shot down by a German fighter on May 28, 1944 over Holland.The crew: F/Sgt Jerzy Koziolek (pilot); F/O Witold Osika (2nd pilot); P/O William Tapp (navigator); F/O Wladyslaw Szymanski (wireless operator); Sgt Marian Myszor (flight engineer); Sgt Bernard Jankowski (bombadier); F/Sgt Ludwik Maciejewski (gunner) and Sgt Jan Duchaczek (gunner). Please, contact me if You can associate names with these airmen faces. 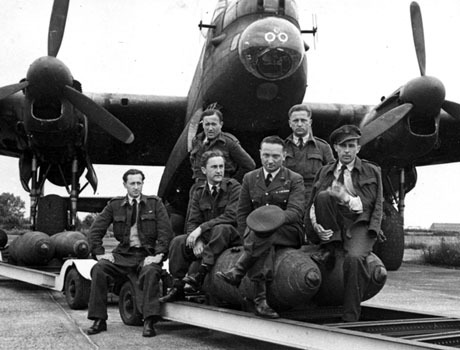 Left: The crew of F/Lt M. Kostuch - VM, DFC, seats in the front with hat on his knee. Directly to his right is air bomber F/O J. Ichniowski (via Rodeny Byles). Right: Multiple scaffoldings were required to allow fitters to do many tasks at the same time. 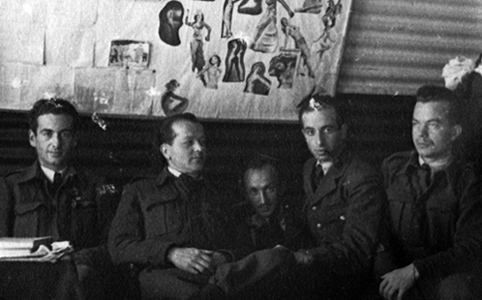 Left: The bomb-aimers: A. Dauman (left); Dlugaszczyk, A. Dradrach, P. Schontal and C. Blicharski. Notice the corrugated steel wall of the Nisseen hut, which served as a basic quarters for the unit at Faldingworth. 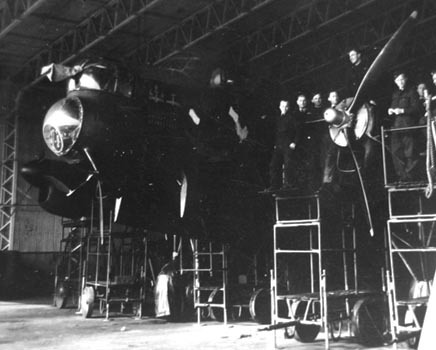 Right: Damaged bomber being serviced at Faldingworth in April 1944. 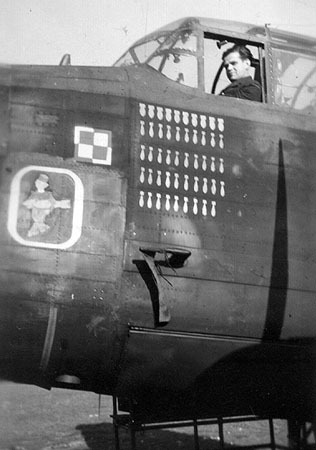 Notice broken windscreens of the cockpit canopy. RAF Faldingworth,1945. BH-F with its crew and some of the squadron's ground personnel. This is probably F/Lt Horbik crew. Picture from the collection of the a/c flight engineer, F/Sgt Edward Huk, fourth from left in the back row. In the third row, seventh from left is W/O Zbigniew Torka (mid-upper gunner), thirteenth in that row is F/Sgt Marian Sobczak (flight engineer). Standing on far left is Sgt Franciszek Opaska. 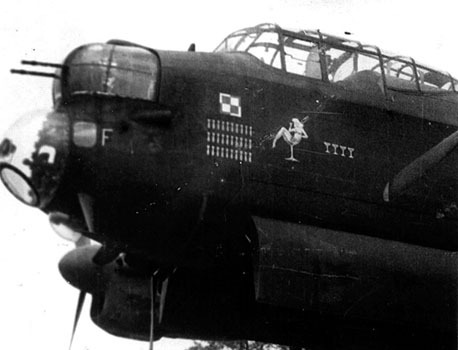 White circle painted on the nose indicate aircraft belonging to the First Bomber Group. 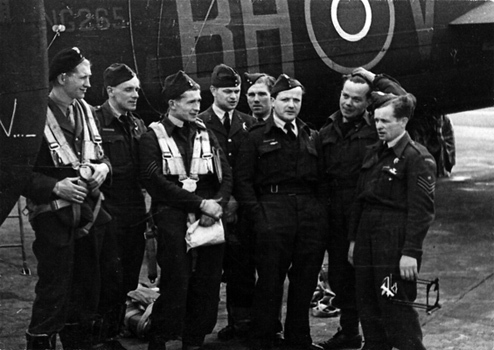 Left: The crew of the BH-C in J945. Third from left: Sgt W. Pruss. First on the right is W/O J. Bilinski (gunner); needs info. 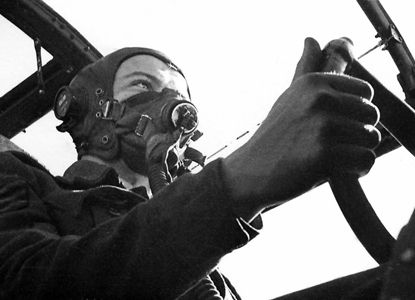 Right: Sgt Matejski at the controls of the Lancaster. 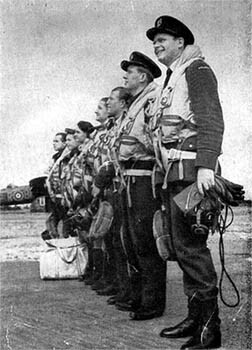 Left: The crew of the BH-V, from left: Jerzy Koltonowski, Jozef Soltys, Jan Krzewinski, Tadeusz Wierzbowski, Hieronim Stawicki, unknown, probably groundcrew, Czeslaw Blicharski, Franciszek Franczak. Right: probably Spring 1945. 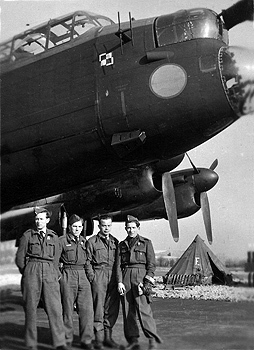 Jerzy Koltonowski (left), Hieronim Stawicki, C. Blicharski and J. Krzewinski under the BH-E. Notice the ground crew tent marked with the letter "E" pitched by the dispersed aircraft. 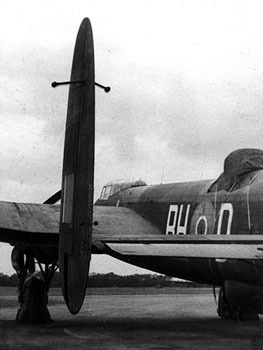 Left: Piloted by F/Sgt Gryglewicz, PB730 (BH-R) after take off accident at Faldingworth on 7 May 1946. Crew safe. The aircraft was written off. 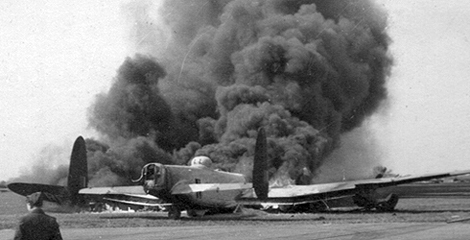 This was the second accident involving PB730 with Gryglewicz as pilot. On 10 May 1945 it crashed on landing at Melsbroek airfield, Belgium while returning from an ‘Exodus’ operation. The entire crew and 24 prisoners of war were safe. 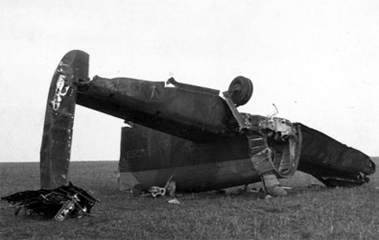 Right: Fragments of the NG269 (BH-K) which crashed during night training flight near Faldingworth in January 1946. The whole crew perished. RAF Faldingworth, July 1, 1946 - The Squadron Day. From right : unknown, S/Ldr E. Prusiecki, W/Cdr B. Jarkowski, W/Cdr R. Beill (liaison officer to the Bomber Command) Gen. M Izycki and unknown. 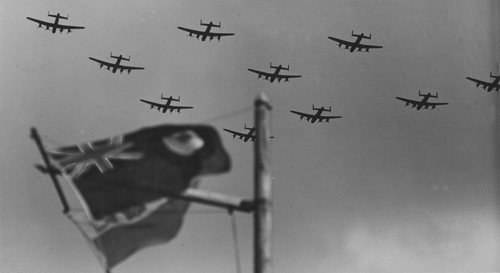 Below are series of photographs taken during the squadron's final fly past on October 11, 1946. The same day orders were received to disband the unit. 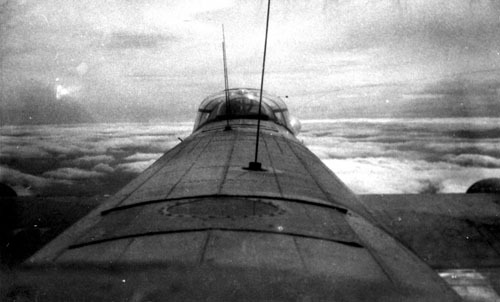 The view of the Lancaster's cockpit canopy viewed from a dorsal turret. Notice barely visible a/c serial number painted under the port wing, the practice started only after the war end. Farewell to the Polish Lancasters. RAF and PAF standards on the Fladingworth flagpole not to be seen together again.